BSC offers power assisted door controls that can convert most any door to an electronically operated door. These door operators will open and close with conventional wall buttons, wireless transmitters, or overhead sensors. They also operate as conventional door closers. 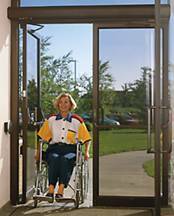 People not needing the power assist can operate the door manually without having to strain to open the door. We feature superior quality Gyro Tech brand sliding doors, swinging doors, door conversion units, fire doors, bi-fold doors, and activating devices for automated pedestrian doors. All products come in both automatic and manual styles.